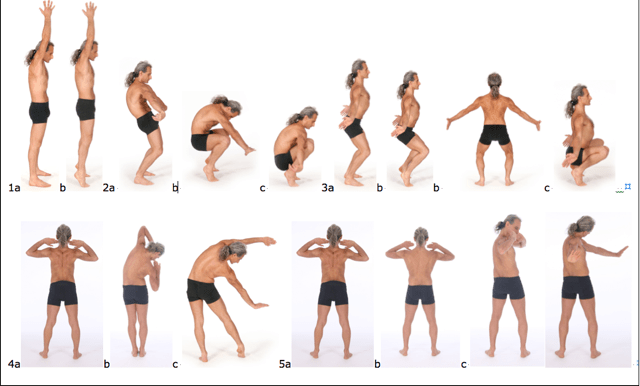 Basic Spinal Movements In this blog I will be examining a sequence of postures done from a simple standing posture that in its simplest form involves moving the trunk and spine into its 8 main ‘pure’ positions. This is one of the most effective and accessible practices for anyone and can give tremendous release of back and other pain as well as significantly increasing energy levels, improving functional core strength, reducing stress and improving the health of your internal organs. The key to effective spinal movements and core stabilisation is to always be able to breathe into the abdomen using the diaphragm and always initiate each spinal movement from the region of the navel and the ‘navel spine’ (L4-L5). Once you release the muscles of forced abdominal exhalation that many people habitually use to ‘engage their core’ using abdominal breathing or at least the feeling that you can breathe into the abdomen, then the spine is free to move from its base at the ‘navel spine’ (L4-L5) near the sacrum. Once you move your spine using the internal forces (trunk muscles) rather than external forces such as gravity, the use of another limb or momentum, then this will create tremendous core strength. In other words to move the spine you must initiate movement from the core with a sense that the core feels relaxed enough to breathe there. At this point the abdomen may feel quite soft to touch. However, once the movement begins the abdomen begins to firm because it is moving. This is an important key to functional mobile core strength and a pain free back. This is also a great preparation to many advanced postures including many advanced arm balances and backward-bending postures. If you are prone to back or spinal problems do not bend the spine in any way that causes pain. Be particularly careful to emphasise movement in the spinal joints more from where there is stiffness and less from where there is flexibility. A good rule for bending backwards (spinal extension) is to try to lengthen the front of the body rather than to shorten the back of the body. Similarly avoid creasing the skin of your back if you can as this is usually associated with spinal compression. Also avoid excessive movement at the hip joints, as this is usually associated with excessive movement around the weakest most flexible parts of the lower back (lumbar spine). Try to lengthen (traction) the spine before you ‘bend’ it any direction. Also, try to move the spine one vertebra at time from the base upwards, i.e. move first from the 5th lumbar vertebra (L5), then move the 4th lumbar vertebra (L4), then the 3rd lumbar vertebra (L3) etc. Moving the spine one vertebra at a time helps develop core strength, increase spinal flexibility and improve blood flow through the spine and trunk. If you are prone to knee problems do not bend the knees more than half way if it is uncomfortable for the knees or if you can’t come back up from a squat position slowly and with control. If you are prone to shoulder problems do not raise the arms above shoulder height if it is causes pain or discomfort especially in the shoulders, but also in the lower back or anywhere else. If you are prone to neck problems ensure that when you lift your head you move the throat forward as you lift the chin up; but do not raise your head if it causes pain in the head, neck or back, or if it makes you lose your balance. If you are prone to cardiovascular problems do not raise the arms above shoulders if you have a cardiovascular problem that can be irritated by raising the arms. Bring down the arms and lengthen the back of your wrists and fingers. Push your sitting bones down and forward, and keep the top of your hips backwards. Bend the elbows and bring the back of the hands together then take the arms forwards and up. Lengthen your spine from the navel to lift your shoulders, elbows, wrists then hands. Lengthen your spine by relaxing your trunk muscles, then lifting your arms higher and lowering your tailbone. Breathe naturally into your abdomen. Bend your knees and bring down your arms. Turn your shoulders inwards and lengthen the back of the body. Lengthen your wrists and fingers to create the ‘Large intestine gesture’ (Atanu puritat mudrâ). Bring your sitting bones under your shoulders. Move the navel (and the navel spine) forward and down and bend the spine into a smooth forward bend one vertebra at a time. Lengthen the back of your trunk without shortening the front. Stay here, or raise the heels. Stay here, or bend the knees further. Ideally your abdomen should feel firm at the front but soft in the sides and in your back. It is important to check that you are relaxed enough that you can breathe naturally into the abdomen. Also check your neck is free and your fingers are lengthened but they are free enough to move. Come back up by straightening your knees, then again bend your knees. Turn the shoulders outwards, open the palms to create the ‘Lung gesture’ (Kloman mudrâ). Move the navel (and the navel spine) forwards and upwards and bend the spine into a smooth backward bend one vertebra at a time. Lengthen the front of your trunk without shortening the back (try not to let any skin crease on your back when you bend backwards. Move the hips back to the midline and lengthen the back of the body. Come back up by straightening your knees and lowering your heels. Bend your elbows to create the ‘Heart gesture’ (Buddhizuddhi mudrâ) and once again lengthen the back of the body. Move your navel to the left side and upwards to lengthen the left side of the body. Move one vertebra at a time as you breathe into your right abdomen. Lengthen your left side of the trunk and lift your left shoulder and elbow without shortening the right side of your trunk. Stay, or take your left arm forwards and upwards and take your right arm down. Push the right sitting bone forward and up. Move your navel to the right side and upwards to lengthen the right side of the body. Lengthen your right side of the trunk and lift your right shoulder and elbow without shortening the left side of your trunk. Stay, or take your right arm forwards and upwards and take your left arm down. Turn your navel to the right side, then turn your ribs, then your chest, and then your shoulders and elbows. Straighten the arms at the elbows. Look over the left shoulder with your left ear slightly lifted. Relax your throat, tongue, jaw, lips and eyes. Bend the elbows and come back to the middle with the navel first and the shoulders last. Turn your navel to the left side, then turn your ribs, then your chest, and then your shoulders and elbows. Look over the right shoulder with your right ear slightly lifted. Bring down the arms and come to the front of your mat with your big toes touching and the heels apart. Relax. Below is a short low resolution segment of the Yoga Synergy Spinal Movements Sequence DVD by Simon Borg-Olivier. This short sequence forms the basis of what is described above. More complex as well as simpler versions of this sequence are also taught on this DVD, which is available from www.yogasynergy.com or by emailing yoga(at)yogasynergy.com. Join our mailing list to receive the latest news and updates from the Yoga Synergy team.